Scone Concrete offers a range of prestressed concrete fence posts, including post and rail fences. Specifically designed to replace timber posts in fence lines, post and rail fences are prestressed, meaning low relaxation high tensile wire made by Onesteel is run through the post mould and placed under tension. The posts measure 2400mm long and feature a recess on the top to allow for a rail measuring 50mm wide. The posts measure 150mm square and feature five holes for running wire to attach netting. 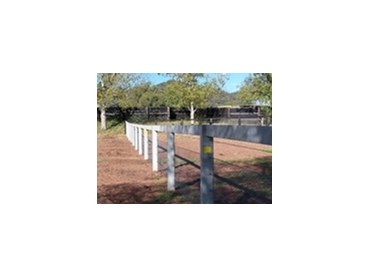 The rails measure 3000mm long, 150mm deep and 50mm wide and there is even an intermediate equine post available which measures 150mm x 150mm x 2400mm (L), however, this does not feature a recess rail as they have been specifically designed for running wires with droppers in between. The end sections of these prestressed concrete post and rail fences can be stayed by using a 'bed log' or a pipe stay. Additional information is available from Scone Concrete.